Before I went to Saturday’s No Room for Racism Rally at Federation Square, I had massive doubts. I don’t see the “far-Right” as any kind of enemy, in many ways I don’t blame them for grabbing hold of things like halal certification with the same vitriol as some people grab onto 9/11 conspiracy theories, or some Christians the return of Jesus. Like the Anzac Myth, these stories help humans explain their existence and give them a framework in which to operate in the world. No one knows more about this than mainstream media organisations and politicians in parliamentary politics. 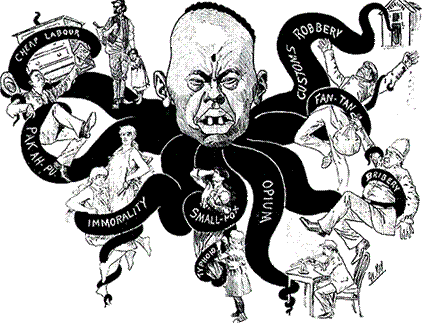 Since 1788, White Australians have been controlled through fear of Asians. Asians who are not white and don’t speak English. We had the drummed up fear of Chinese immigration during the Gold Rush, than the Japanese, than the Communists (from Russia, China and Vietnam- all Asian countries) now we have Muslims, the majority of whom live in Asia. For many working class Australians life is not that easy. I’m not just talking about a seeming lack of access to resources- cars are expensive to run, housing is expensive- no-one gets ahead. And yet the message from our pop culture is that, with hard work and smarts ANYONE can get ahead. When people don’t, they get agitated. When long hours in dreary work after many, many years sees them not gaining more or better material rewards- they build up anger. The easiest people to blame in this situation is someone different to us. Someone NOT working, someone who wears a headscarf or speaks another language someone with a different skin colour. When politicians say “Stop the Boats”, they’re tapping into that fear of the Other. There are lots of things the Australian government could have done rather than spend 9 billion dollars on Operation Slipper in Afghanistan, and a total of 50 billion dollars on conflicts since 2001 that would have made Australia and the world a safer place. The real reason successive governments have gone to futile wars that have no strategic advantage for anyone except arms companies is to play the political agenda. Drumming up the fear of terrorism keeps people like my Reclaim Australia friends from asking other questions about Australian society. Like, who decides what makes it on to the news each night? Politically I think it was a crazy move by Reclaim Australia to have a Rally Easter Saturday. I sincerely believe they had more sympathetic supporters than who turned up at the rallies. These people are more the camping, sport watching, beer swilling types than the go to a rally in the middle of a long weekend type. The only ones who turned up were a fringe. And I respect them like hell for that. They turned up for something they believed in. Yes, they are misguided- but they took time out from the 1 million other things they could be doing with their lives and stood together for something. It’s a racist motive, but I’ve already explained why I understand, if I can’t approve of that. I have far more time for people who live genuinely in their ideas and try to work with others to shape the world than people who just sit on the side lines and criticise others for having a crack. (That’s kind of the end of Part One- the next Part is wordy and explains my experience and how I would have liked to see things done. Thanks for reading this far if you stop now- I really appreciate it). I was more worried about the Channel 7 and Channel 9 news crews running around looking for any sign of tension, any sign of physical violence. And ignoring calm conversations and people who were on “opposite sides” helped each other out (and there was plenty). This is how nightly news works. They don’t want substance, they want emotion- something inspires anger, fear, elation. That keeps you watching and the viewing numbers up. Any substance or depth means they might lose the race and the other channel will get the advertising dollars. I would recommend NOT watching nightly news at all. Its not news and it won’t inform you. Read papers or the internet. If you have half an hour or an hour to watch news and that’s all you have, watch something that at least has a little more breadth like ABC or SBS. So I went out on Saturday not wanting to blockade or even be physical. 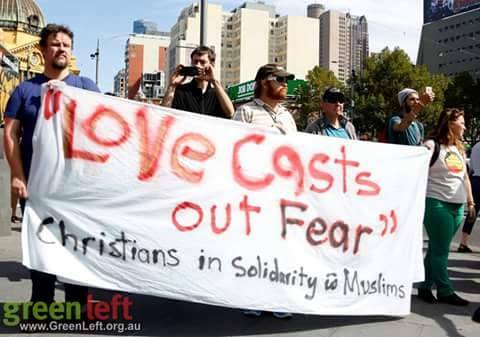 The Muslim population in Australia are generally scared. They are the scapegoats of corrupt political leaders and lazy media. So I went in solidarity, hoping that if Reclaim Australia made the news at all, then Muslims watching it would see more people at the counter-rally. I still think this was a better way to run the day. No clashes. We will just have far more people. Also letting people assemble creates space for conversation. I got in the middle of several scuffles on Saturday. I got swiped by Reclaim Australia people, I got swiped at by No Room for Racism people- sometimes I didn’t know who it was ripping my hat off of my head swearing abuse at me. But when violence happens we lose space to solve problems together- so I got in the way as best I could. I never felt threatened either. Sometimes you get scared in physical situations, but I never felt like either the angry looking Reclaim men, or the angry looking no room for racism men were going to punch me or someone else, but I felt fearless of this- the situation and people are much less dramatic than channel nine makes out. The tension was extremely high, the mood foul. I observed 2 things that should make you feel hope for humanity. Firstly, the fact that of the thousands of people at Federation Square, less than 100 on either side engaged in picking out targets on the other side and yelling at them. Secondly, I got in the middle of lots of scuffles. More than 5 at least. At one point an elderly man on crutches who was clearly with the Reclaim Australia Rally was blocked by police and the No Room mob. Things got tense and I saw he was just trying to leave, but worked up and angry, the Counter Rally started pushing against him. Not with arms, but as numbers swelled in the line, he was getting caught up in the crowd. I managed to get in front of him and yelled out “make way for a disabled man!” (best language I could think of at the time). People turned to see who it was. This man had an Australian Flag flying high, and Australian flags pinned on his hat. Amongst the people looking at him were punkier looking anarchists, with black jackets. One of these had nearly turned on me earlier when I got in the middle of his fight, but when he saw the elderly man behind me this time, he relaxed and stepped back. I got the man to the edge of the edgy crowd and said “Happy Easter” he said the same to me and he wandered off. The people who came out for Reclaim Australia on Saturday are angry, confused and they truly believe that halal certification of food is a threat. Unless we become a more democratic and just society, extremist groups like these will get numbers and flourish. I think as a country, we can do better and we damn well better try. A little less worrying about the cricket and a little more worrying about how much money we want to give to the Gina Rinehart’s and Rupert Murdoch’s of the world. To me, Tony Abbott, Bill Shorten, Reclaim Australia and the minimal violence we saw on Saturday are the symptoms of a corrupt system that exploits the fears of the poor for the profit of the rich. All of us need to start working to do better before we dump our prosperity into the dust bin of history.